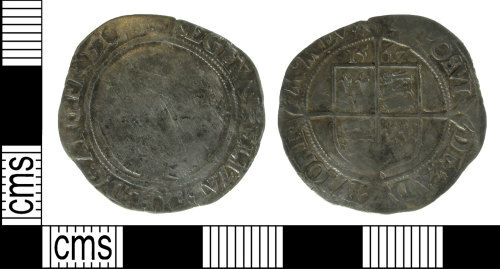 A post medieval silver sixpence of Elizabeth I (AD 1558-1603). Second issue dating to 1567. Lion initial mark. North, 1960, p134. 1997. Reverse description: A square shield on long cross fourchee. The date above shield is 1567. Reverse inscription: [ ] OSVI DEV AD IVTORE M ME [ ]. A silver sixpence of Elizabeth I (1558-1603), second issue of 1561-1582, dated 1568. Coronet initial mark. As North (1991), p134, number 1997.